Since the beginning of warfare, there has been specialized terms, acronyms, and soldier slang. This was also true of the LRDG and British Army in the Western Desert. This section is a collection of terms, phrases, slang, initialisms, acronyms, etc. that the LRDG trooper would have been exposed to. The words come from a mix, of Arabic, Italian, German, and English slang. These same expressions are found on this LRDG site or in the published literature discussing the LRDG. This page is probably the fastest growing page of the site. If you come across a word you are unfamiliar with, either reading a book or browsing this site, check here to see if it is listed. If it isn't listed, feel free to contact me through the Rally Point and I will try to find its meaning and post it. 2 i/c - Second in Command. Initially the patrols were broken into two half patrols. The OC had charge of the Right Half and the 2 i/c had command of the Left Half. The 2 i/c is the the Assistant Patrol Leader or Executive Officer of the Patrol. 25 Pounder: The backbone of the British Artillery. Cold be used as both artillery and anti-tank gun. 77s: When the war began many people mistakenly called the the 88s a 77. The 7.7cm gun was a German artillery piece from World War I.
Ambush - A surprise attack against an enemy target. See the Ambush Page for more detail. Ammo Boots, Ammunition Boots - Standard issue British (and Commonwealth) service boot. This was an ankle-height black leather boot. The British made boot had a toe cap. The canadian version did not. The boots were then given heel and toe irons (plates of metal nailed into the sole) The soles were also hobnailed. Web anklets, known as gaiters, were worn with the boots. L'arco dei Fileni de Mussolini - The actual name for the Marble Arch in Italian. This was the spot of the longest lasting Road Watch in LRDG history. The Arch of Fileni was built in the Gulf of Sirte, on the border between Tripolitania and Cyrenaica, and included two huge statues depicting the brothers Fileni, legendary Carthaginian heroes who fought alongside the Greeks of Cyrene to define the boundaries between the two civilizations . The Arch was demolished in 1973 by the Libyan government and the two statues now lie at the edges of the road. Astrofix: Same as Star shoot. Using the theodolite to determine your position by observation of the stars. Autoblinda: Italian for armoured car. Surprisingly what the Italian tanks lacked their armoured cars made up for. While not capable of withstanding cannon fire, they were reliable, typically had large tyres and were capable machines in the desert. the AB41 and 42 were especially good. One version of the AB42 was used as a pursuit vehicle against the LRDG. Automatics, Automatic Pistol: A self loading hand gun or side arm. Not to be confused with an actual automatic weapon, Automatic pistols are actually semi-automatic in that one pull of the trigger will only fire one round. If a pistol is modified to fire fully automatic, it should be re-classified a submachine gun. Ball Ammunition: Your basic round of ammunition. Others common rounds AP, armor piercing, API, Armor Piercing Incendiary (tracer). Beat up: To attack a target or to be attacked, depending on the context. This could be a raid or an ambush. A combat mission not RECCE. "We had a good beat up on the air field. Six planes blown up and the barracks shot up "
"We got away from the Autoblindas only to have a beat up with two L3s "
"The skipper planned a beat up at the cross road where we waited most of the night for a petrol truck to show." Bedouin: One of the Bedu. Bedu, the Arabic word from which the name bedouin is derived, is a simple, straightforward tag. It means "inhabitant of the desert," and refers generally to the desert-dwelling nomads of Arabia, the Negev, and the Sinai. For the LRDG, some of the Bedouin were friendly and some not so friendly. Many just wanted to be left alone. Many also wanted to trade fresh food for cigarettes, candy, food tins and other items of interest. At times they could be a source of important information or aid. Caption: That bint from the Sweet Melody promised she'd write. Bint Kwoyees: A good woman, a girl friend, honey. Bolt Action Weapon: A weapon that requires the manipulation of a lever (the bolt) in order to chamber a cartridge each time it is to be fired. Niente Bono, Mush Kwoyees: no good, bad. Molto Bono, Kwoyees Kater, Kwoyees ou wie: Very good. Blue, the Ghot. 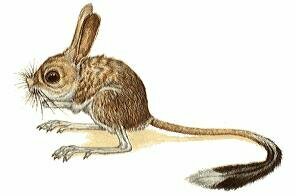 Original haunts of the Desert Rats. Bombay Bloomers: A special type of Khaki Drill trousers issued throughout the Desert Campaign. The loose fitting pants could be rolled up and buttoned into shorts that fell just above the knees. When unbuttoned, for an average height soldier they would usually fall to perhaps a few inches above the ankle. While somewhat unpopular they did provide added warmth on cold nights. Bully or Bully Beef: Pickled or tinned beef. The chart simply gives you an idea of the size of the bullet. In some cases a bullet is available in both millimeter and caliber. The best examples are the ACP (Automatic Colt Pistol) ammunition. However, most ammunition is made in either calibers or millimeters and does not have an equivalent size in the other category. Sometimes a bullet's given caliber is not actually the real size of the bullet. This is especially true of the .32 ACP and the .38 Special rounds. The bullets are actually smaller than the stated caliber of the weapon. Both bullets are about two calibers smaller than the given size. Cartridge: When dealing with small arms, short for ball cartridge. What is often wrongly called a bullet. The cartridge is a round of ammunition containing a projectile (the bullet) a powder charge contained in a casing, and finally a primer which will ignite the powder. If the bullet is not present it is a blank cartridge. Caunter Pattern: An British Camoflage pattern used in North Africa. The scheme was used in 1941-42 and was supposedly developed by Col. Caunter of the 4th armoured Brigade. The scheme was not known by the "Caunter" at the time but as time passed, it became known as the Caunter Pattern. According to some sources, the colors used were: Light Stone, Silver Grey and Slate in a horizontal splinter pattern. Photos often show vehicles with a light blue in the pattern but some authorities say this is actually the silver grey. The silver grey fades to a pale blue. CMP: Canadian Military Pattern. Vehicles designed for military use in Canada as opposed to civilian vehicles. Crusader: Probably the most important British made tank used in the Desert Campaign. See also Cruiser. Cruiser: Basically what the Americans and Germans called a medium tank, and what today is called a main battle tank. The British had three basic categories of tanks. Fast lightly armored tanks fell into the Cruiser classification. Initially the tanks had a Christie suspension system (torsion bar, larger bogie wheels), thin armor and often nothing more than a two pounder (2 cm) main gun. and a few machine guns. The two most important cruiser tanks operational in North Afrika were the Mk II, Mk III,and the MkIV (Crusader Series). the light American tank, M3, Stuart (Honey) also functioned in the role of a Cruiser tank. CWT: A British/Commonwealth abbreviation for Hundred Weight. Thus a 30 CWT was a vehicle capable of towing 3,000 pounds or one and half tons. A 15 CWT is a 3/4 ton vehicle. Fitter - The Fitter is the maintenance vehicle. It carries the necessary supplies to keep the patrol mechanically sound and moving. In the case of the LRDG, this might mean carrying extra carburetors or radiators for the trucks, as well as numerous spare parts such a springs, shocks, and other vehicle parts. The patrols mechanic would be on this vehicle. FOB: Forward Operations Base. A main staging area behind the enemy lines where the LRDG would stage its missions. Typically this was an out of the way area offering protection. Force: Typically a Rading Force put together for a specific mission. The forces are often designated with a letter such as "Force B" or "Force Z". The term almost always refers to Commando or Commando type unit reinforced with a larger body of native forces such as the Sudan Defense Force or in some cases a Commando unit that has mission specific personnel attached to them. 4 'n' 1, tracer (four and one, tracer): A mix of ammunition, esp. for machine guns where for every four rounds of ball ammunition there is one round of tracer. This was done in order to aid aiming the gun and walking your fire into a target. Other mixes are used but 4 'n' 1 was very common. Sometimes just referred to as 4 'n' 1. Anti-tank rifle in Italian service. Ghibli: Italian bomber aircraft used by the colonial forces Often used for aerial reconnaissance. Grant - American made, Medium Tank, M3, used by the British Army. It was similar to the the M3 Lee Tank used by the Americans , excepting the radio was located in the turret and there was no commander's cupola. Gutrah: (also called Keffiyeh) The Arab Head-dress (the scarf part) that is so commonly associated with the LRDG, and SAS. Typically it was worn more often in camp than on patrol. The agal, is the black bands used to keep the Gutrah in place. Hebron Coat: A locally acquired goat-skin coat usually black or white in color. The shaggy goat fur was worn on the inside to help insulate the trooper. Honey - American made, Lt Tank, M3 or M3 Stuart. Later version was the M5, but it did not see service in North Africa. ILRS - Indian Long Range Squadron. A four patrol unit of the LRDG. Infantry Tank: The British version of a Heavy Tank. Infantry tank were designed to move with infantry, sacrificing speed for heavy armor. Despite the added weight, the tanks were usually armed with small caliber guns such as 2 or 6 pounders at the time of the Desert Campaign. The most famous used was the Infantry Tank II Matilda. At the beginning of the desert war, the Matilda could take a punch from anything but the dreaded 88, it was known as the Queen of Desert. They were quickly replaced by the US Medium Tank, M3 Grant as they became available. Jerry Can - The German 20 liter petrol/water cans. The cans are later copied by Americans and British, and become the standard military issue 5 gallon fuel cans. Typically a white cross was painted on cans used for drinking water or occasionally the word "water" or the letter "W" would just be written in black or white. Keffiyeh: (also called Gutrah) The Palestinian/Arab Head-dress (the scarf part) that is so commonly associated with the LRDG, and SAS. Typically it was worn more often in camp than on patrol. The agal, is the black bands used to keep the Keffiyeh in place. 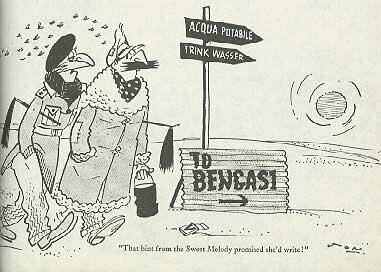 Khamseen (Khamsin): An oppressive hot wind from the south or south-east, which in Egypt blows at intervals for about 50 days in March, April, and May, and fills the air with sand from the desert. Kit: anything from a soldier's personal equipment to a woman. Kiwi marking found on T Ptl. 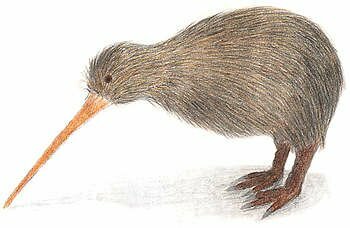 Kiwi A small flightless bird native to New Zealand. A person who lives or is from New Zealand. (L3/33, L3/35) : The official term for the Italian light tanks or "tankettes". The were really nothing more than a lightly armed machine gun carrier normally employing twin 8mm machine guns. Some models were upgunned with 12.7 mm or 14.5 mm machine guns. Some were alos armed with the highly effective 20mm Solothurn semi Automatic AT Gun. While virtually useless against other armored vehicles, they were a deadly threat to the light skinned LRDG Trucks. When people talk about knocking out Italian tanks with a rifle these are the ones they are talking about. A Boys AT rifle would easily defeat the armor of these vehicles. . The .5 in MkV Vickers could pentrate at very close range. 303 MG fire might also prove deadly to the light skinned vehicles but not the frontal armor. Italian L3/35 with Solothurn 20mm AT rifle, more than a mathc for a Chevy 30CWT! L'arco dei Fileni de Mussolini - The actual name for the Marble Arch in Italian. This was the spot of the longest lasting Road Watch in LRDG history. The Arch of Fileni was built in the Gulf of Sirte, on the border between Tripolitania and Cyrenaica, and included two huge statues depicting the brothers Fileni, legendary Carthaginian heroes who fought alongside the Greeks of Cyrene to define the boundaries between the two civilizations . L'arco fu demolito nel 1973 dal governo libico e le due statue giacciono oggi ai bordi della strada. The span was demolished in 1973 by the Libyan government and the two statues now lie at the edges of the road. Lee - American made, Medium Tank, M3, used by the American Army. It was similar to the the British Grant Tank, excepting the radio was located in the body of the tank instead of the turret and the commander had a cupola with a .30 caliber MG.
LRDG - Long Range Desert Group. LUP: A Lying Up Position the British term for a Rallying point, forward of the Forward Operations Base(FOB). This could be a smaller base of operation where a patrol would hide while conducting missions or a hasty spot chosen for a quick rest or place to meet in the event of enemy attack. . See also Rallying Point Sometimes called Charlie love, charlie harry or charlie iffey. Marble Arch - The actual name for the Marble Arch in Italian L'arco dei Fileni. This was the spot of the longest lasting Road Watch in LRDG history. The Arch of Fileni was built in the Gulf of Sirte, on the border between Tripolitania and Cyrenaica, and included two huge statues depicting the brothers Fileni, legendary Carthaginian heroes who fought alongside the Greeks of Cyrene to define the boundaries between the two civilizations . The Arch was demolished in 1973 by the Libyan government and the two statues now lie at the edges of the road. M 13/39: Similar to the M13/40 .it was armed with a 3.7 cm main gun in the HULL , and twin machine guns in the turret. Captured ones were also employed by the Australians for a very short time The armour was also very light. The Boys AT gun could stop this tank. M 13/40: The best of the Italian tanks. armed with a 4.7 cm main gun in a turret , and twin hull machine guns. Captured ones were also employed by the Australians in modest numbers. Machine Carbine: British for submachine gun. also called, submachine carbine. Maschinenpistole: German for submachine gun, literally, Machine Pistol Abbreviated MP. MK III (Mark 3): The older version of the SMLE rifle, standard issue to ANZAC forces and common in the British Army until the introduction of the No. 4 Rifle. Not to be confused with the Panzer Mk III, a German medium tank. MO - Medical Orderly/Officer. On a patrol, this maybe a doctor (medical officer) or perhaps just a highly-skilled medic (medical orderly). Moffer: (Germn Mutter, Mother) Tedeskee, Jerry, Germans, Boche. Mushti: A chap, a fella, a mate . NAAFI (Navy, Army, Air Force, institutes): A uniformed civilian organization within the British Government that oversees the retail sales and entertainment for all branches of the British military. Formed in 1921 and providing a service similar to the American USO, NAAFI provided entertainment canteens and traveling shows for the British soldiers during WWII. Niente: Used in combination with other words to display a negative. OC - Officer Commanding, Commanding Officer. OIC - Officer in charge, patrol leader, officer of the day. OP- Observation Post. The most forward position of a patrol. Typically a spot where Road Watches were conducted or a small spot where a trooper or troopers would watch for the enemy and provide early warning for the rest of the patrol. At night the position the observation past may be moved to a closer position and become an LP or listening post. P-37 (Pattern 37 or 1937 Pattern) - The British web gear, that is the equipment harness that was approved for us in 1937, replacing the World War I era 1908 Pattern web gear. The main components of the web gear include the belt, braces (suspenders or shoulder straps), compass/ammunition pouch (for pistol), universal pouch (often called a Bren pouch), bayonet frog, haversack, water bottle carrier, and water bottle (canteen). Other items included pistol holster, binocular case, respirator (gas mask) case, and several other items. Panzer - Any german armour. In an official report, tanks, self-propelled guns, armoured transport, etc would be identified as specifically as possible. There is a big difference between a PzKfw II (Panzer Kampfwagen II)and a PzKfw IV (Panzer Kampfwagen IV). Patrol (Ptl) - The fighting units in the LRDG. Eventually the LRDG operated Patrols consisting of six vehicles, each vehicle providing an essential element of the patrol. Phonetic Alphabet - With the advent of Radio communications a need to clarify letters of the alphabet was quickly discovered. Communications were often less than clear and it was often difficult to distinguish between certain letters such as B and P. Today, there is an international phonetic alphabet that was initially developed by NATO during world War II each nation had its own and in some instances different military branches (army,navy, etc.) had different phonetic alphabets. Popski's Private Army A demolition and recon unit that began as a the Demolition Platoon in the LRDG led by Vladimir Peniakoff, Popski. Popski's army relied heavily on local Arabs and was quite the private army. In some ways he was the Lawrence of Arabia of the WWII Desert War but without the same amount of publicity. He and his army later went on to fight with partisans in Yugoslavia and Eastern Europe. Portee - Mounting artillery pieces on the bed area of a truck. This was not a true self-propelled gun. It was possible to remove the gun from the truck bed and set it up for firing. The British found success in using the portee system with their two pounder and six pounder anti-tank guns. SdKfz 232, heavy eight wheeled with a 20mm semi automatic cannon and MG, a scout /command vehicle. German armored cars were a major headache for the LRDG. When reading about the LRDG, it seems after air attack, armored cars were the biggest threat to the safety of a patrol. Qibli: A hot south wind. Raid - A direct action mission in which a patrol or patrols would make a surprise attack against an enemy position. Unlike other combat missions, a raid is not designed to take ground but is is either used to gain information or destroy or disrupt certain enemy capabilities . Rally Point, Rallying Point (RP) - American term for LUP or RV. A location designated, usually by the patrol commander as a place for the patrol to reform in the event of dispersal or attack. Rallying points are some times assigned in advance or as the patrol passes a likely spot that is easily recognizable. A good rallying point is easy to defend, offers concealment from enemy observation, and offers an escape route. Typically a rallying point has a "door"; that is a in a single entry point from which all patrol members will enter and exit. By doing this, the patrol knows that if the location is approached from some other direction it is most likely hostile forces. A special rallying point is the Advanced Rallying Point. This is called the Objective Rallying Point or ORP in the United States Army. The Advanced Rallying Point is the rally point nearest the objective or target that the patrol is attacking or observing. This is not an observation post. It is the most forward location for the patrol and the place from which they would set up communication with headquarters, and send out road watches and other mission specific patrol elements. Razorbacks - Sand dunes with innocent frontal slopes that drop off like a cliff on the back side. Very dangerous for a vehicle moving at any speed. RECCE or Recce - Reconnaissance mission. Recce Vehicle. Reconnaissance vehicle. Reconnaissance missions are designed specifically to gather information. While in a strict sense all military missions have an intelligence gathering component, the reconnaissance mission is purely for information gathering and all contact with the enemy is avoided unless absolutely necessary. While the patrol would have combat capabilities they are defensive in nature. The idea is not to be discovered or leave evidence that you were in the area. RTR - Royal Tank Regiment. 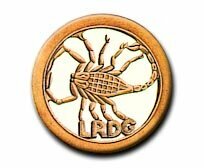 The LRDG typically wore black RTR berets with the Scorpion insignia as their unit headgear. RV: Rendezvous or Rendezvous Point. What Americans called a designated Rallying Point. SAS - Special Air Service. Unlike the LRDG, the SAS typically operated combat patrols, primarily airfield raids. Today's SAS provide the role originally fulfilled by the LRDG, long range recons and numerous other special operation missions. SD (Service Dress): The third type of dress wear in the British military. SD is usually reserved for wear when not in combat. Senussi: a Muslim religious fraternity founded in 1837 by Sidi Muhammad ibn Ali es-Senussi Often misspelled Sennusi or Sennussi. Shmeisser, Schmeisser: The common name for an MP38 or MP40 German Machine Pistol. A valued souvenir and robust submachine gun. While they may have been plundered, officially, any enemy weapons used by the LRDG were actually reconditioned and issued through proper channels. Now before you write me, Schmeisser had nothing to do with the MP38/40. Hugo Schmeisser designed the MP18 Bergman and the MP28,II but the MP38/40 was the creation of Heinrich Vollmer. Schmeisser also went onto to make the world's first assault rifle (MKb42 H which became the MP43 and finally Stg 44). So basically just about every submachine gun and assault rifle used by Germany was designed by Schmeisser except the one called a Schmeisser. Smelly: Slang, most likely modern for the SMLE, Short Magazine Lee Enfield. SMLE Short Magazine Lee Enfield. Common abbreviation for the British Bolt Action Rifle, especially the No 1 Mk III. Shai: A sweet syrupy drink made brewing tea, sugar, tinned milk and water. Star shoot: Same as Astrofix. Using the theodolite to determine your position by observation of the stars. Sturmgeschütz (esp Stug III): Literally Storm Gun, or Assault Tank. A turretless version of German tanks often carrying a large caliber gun in the enclosed hull. Similar to Jagdpanzer in design but without sloping armour. Submachine gun (SMG): Typically, a handheld fully automatic weapon that fires pistol type ammuniton.some have selective fire capabilities but most do not. Full-automatic means that once the trigger is pulled the weapon will continue to fire until the trigger is released or the weapon runs out of ammunition or malfunctions. .
Tankettes: Italian light tanks, especially the CV33. Really nothing more than a lightly armed machine gun carrier employing twin 8mm machine guns. When people talk about knocking out Italian tanks with a rifle these are the ones they are talking about. A Boys AT rifle would easily defeat the armor of these vehicles. .303 MG fire might also prove deadly to the light skinned vehicles. Terrain chaotique: French, literally chaotic terrain. Impassible or rough terrain thought to be impassible. Theodolite: A Surveyor's Transit. A portable surveying instrument, originally for measuring horizontal angles, and consisting essentially of a planisphere or horizontal graduated circular plate, with an alidad or index bearing sights; subsequently variously elaborated with a telescope instead of sights, a compass, level, vernier, micrometer, and other accessories, and now often with the addition of a vertical circle or arc for the measurement of angles of altitude or depression. They were essential for getting star readings in order to get an accurate position for the patrol. Tommy gun: The Thompson submachine gun, esp. the M1928. 25 Pounder: The backbone of the British Artillery during World War II. It was used as artillery (indirect fire) and also as an anti-tank gun (direct fire). Trooper: A term used throughout these pages to describe members of the LRDG, typically enlisted or other ranks. There is plenty of evidence in the written sources that members of the LRDG referred to each other as trooper or troops. Tropal Coat: A misnomer for the issued overcoat often worn to stop the chill of the desert night. This was not the Standard British Overcoat (Great Coat) but was a coat similar in design that was issued at first to troops sent to Norway. The coat had a Kapok* lining which made it both heavy and uncomfortable. However the coat was very warm. Tropal was the company that produced the coat. It has been called a Tropical coat, a misnomer. Wadi or Wady: An arabic word for a ravine or valley which in the rainy season becomes a watercourse. Also the stream or torrent running through such a ravine. The wadi could often be strewn with rocks and pebbles similar to a dry stream bed. Wadis would often offer the only cover or concealment for hundreds of miles. W/T - Wireless Telephone, Wireless Transmission. A Radio transmitter/receiver.